We Southern cooks love our casseroles with cream of this-or-that soup, but since I moved to eating organically and locally as much as possible several years ago, I’ve adapted some of my favorite casseroles to using a cream sauce with whatever. 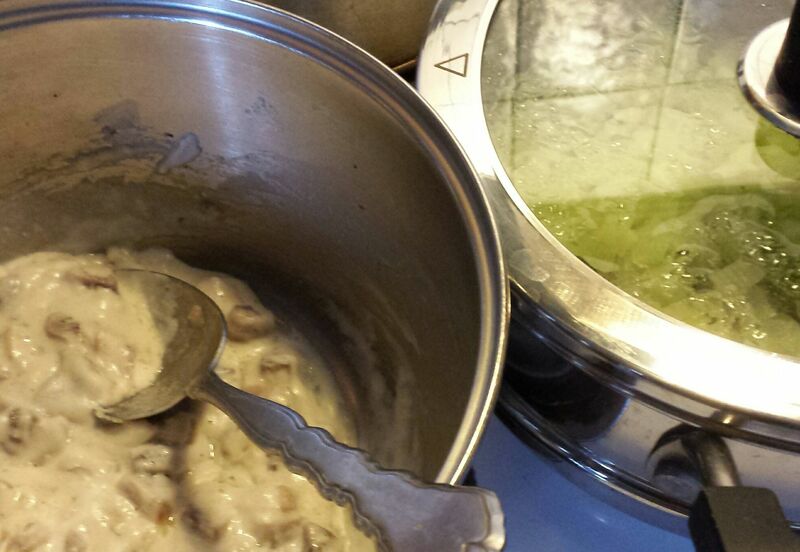 I make faux condensed cream of mushroom soup by making a thick white sauce with fresh mushrooms cooked in the butter. That is what went into the broccoli casserole this afternoon instead of canned soup. Yes, it looks gross but it is SO much better. It only took a few minutes to do it, although I’m not perfect and sometimes I keep a can or two of the processed stuff in the cabinet for when I feel super lazy. This one isn’t completely local or completely organic, but it is a combination of the two. I can’t give you a recipe because I stopped measuring on this casserole years ago. It’s like a crustless quiche, with more cheese and less eggs. I went to church this morning, the very liberal Presby USA one around the corner that I attended around the same time I began this blog in 2005. They are between ministers and Mark Sandlin, whose writing I adore, is filling in for several Sundays. I’m basically an atheist, but I respect a lot of different spiritual traditions, since I believe that any faith that helps you be a better person and encourages you to be compassionate and kind to others is a good thing. I don’t often admit to being an atheist…maybe a searcher would be a better label, but there isn’t really any label that describes my beliefs. I’ve explored a lot. So be it. Tonight this broccoli casserole goes to my friend’s Hanukkah dinner where I get to be an honorary Jew again.